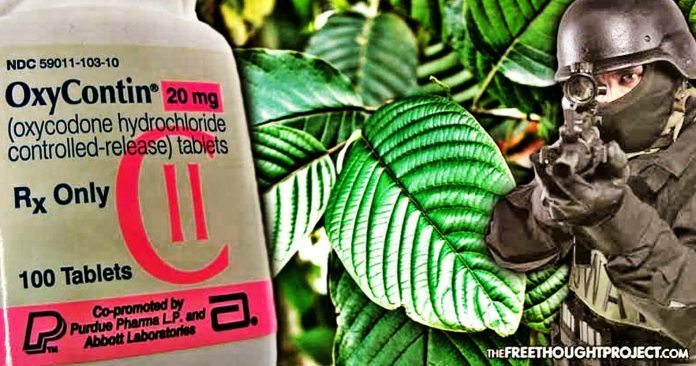 The FDA is proving its loyalty to big pharma and is putting the final nail in the coffin that is the legal, safe, and natural painkiller, kratom. In one of the most ignorant and corrupt decisions to ever come from the Food and Drug Administration, the government agency has declared the kratom plant to be an opioid. Illustrating their servitude to the pharmaceutical industry, the move will only serve to increase the already horrendous epidemic of opioid overdoses and make criminals out of entirely innocent people. Kratom is not an opioid. Opiates are derived from poppies and opioids are man-made opiates. Both opiates and opioids depress the respiratory system and are deadly in this respect as related to overdoses. Kratom is in the coffee family and it does not have any properties of opioid-induced respiratory depression. These facts matter not to the FDA, however, who is hell-bent on making it illegal and will apparently lie through their teeth to do so. Referring to naturally wild growing kratom plant as a “street drug,” Scott Gottlieb, commissioner of the Food and Drug Administration, claimed that he and the FDA are acting “in the interest of protecting public health,” and will therefore attack a plant used by millions to enrich the police state, foster the drug war, and ensure a lifetime of profit for the pharmaceutical industry which has addicted the nation to its dangerous and extremely deadly synthetic opioids. The claims that the FDA is attacking kratom in the interest of public safety would be laughable if they weren’t so insidious. Blatantly lying to the public, Gottlieb wrote that there is no known science behind the use of kratom to treat opioid withdraw. We have been especially concerned about the use of kratom to treat opioid withdrawal symptoms, as there is no reliable evidence to support the use of kratom as a treatment for opioid use disorder and significant safety issues exist. Before taking over the FDA and using his position to enrich his fellow legal drug dealers, Gottlieb was a member of GlaxoSmithKline’s product investment board. And, as TFTP has previously reported GlaxoSmithKline owns a patent on a kratom alkaloid designed for the very purpose of treating pain, thereby alleviating dependency on opioids. One of Kratom’s alkaloids—Speciofoline—was researched decades ago by Gottlieb’s former employer and its effects have been widely studied and reported on. But that’s not all. Other studies—which the FDA says do not exist—have been conducted for the specific task of treating opioid dependency. These patents are essentially useless, however, with the natural version of the plant being legal. Only through prohibition will pharmaceutical companies be able to peddle their synthetic versions which will undoubtedly be far more dangerous and more expensive than the natural version. What’s more, Gottlieb went on to rant and rave about the alleged deaths associated with kratom. As TFTP previously reported, a FOIA request on the cause of death for the alleged 36 deaths associated with kratom illustrated that none of them showed enough evidence to prove that they were actually caused by kratom. Now, even though they admit their data is flawed, the FDA is touting a new number of 44. Even if this number were real—which it is not—it is laughable considering the fact that FDA approved drugs kill tens of thousands of Americans every single year. FDA approved synthetic opioid drugs alone kill thousands more Americans every year than all homicides combined. We can expect to see armed raids on cancer patients and other people treating their pain with this plant. We can expect to see asset forfeiture rise and the wholesale theft of property in the name of enforcing the FDA’s ban. More dogs, kids, and adults will undoubtedly fall victim to the police state as it carries out the will of their corporate masters — laying waste to all those in their path.